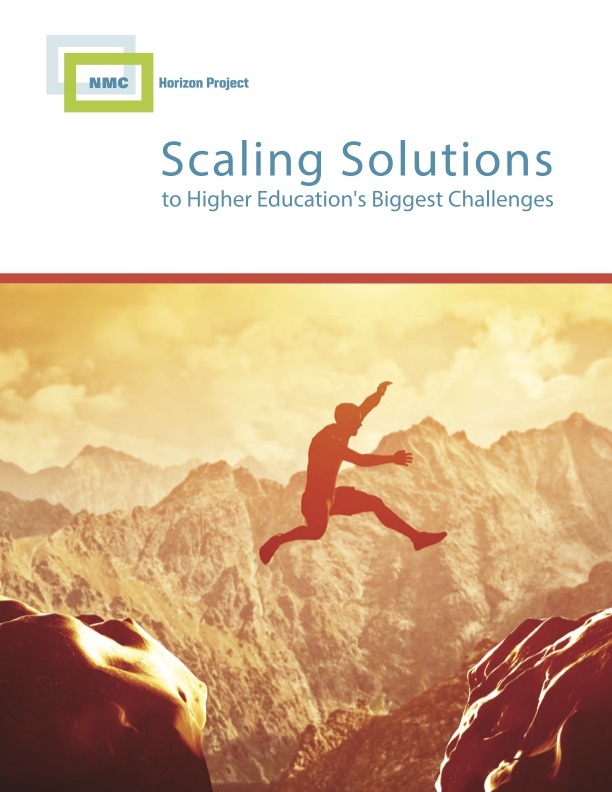 This publication, Scaling Solutions to Higher Education’s Biggest Challenges, aims to identify the challenges obstructing student success and provide exemplars that, if adequately cultivated, can support the widespread adoption of real solutions. By better defining the challenges impeding innovation in US postsecondary education and illuminating high-quality programs and initiatives, it is the NMC’s hope that this report will catalyze critical discussions, projects, and products that bolster student success, making high-quality learning opportunities more accessible to all. The challenges addressed in this publication, summarized in the infographic that follows, can be categorized as largely relating to faculty needs, institutional culture, and technology-enabled practices and programs — all with an eye toward students as the ultimate beneficiaries of the potential solutions. This publication was made possible through the support of the Bill & Melinda Gates Foundation. Hall Giesinger, C., Adams Becker, S., Davis, A. & Shedd, L. (2016). Scaling Solutions to Higher Education’s Biggest Challenges: An NMC Horizon Project Strategic Brief . Austin, Texas: The New Media Consortium. (Volume 3.2, October 2016). Retrieved April 22, 2019 from https://www.learntechlib.org/p/182095/.